This time last week, things looked very bleak for these six young Carillion apprentices - until a Teesside firm stepped in and saved their jobs. 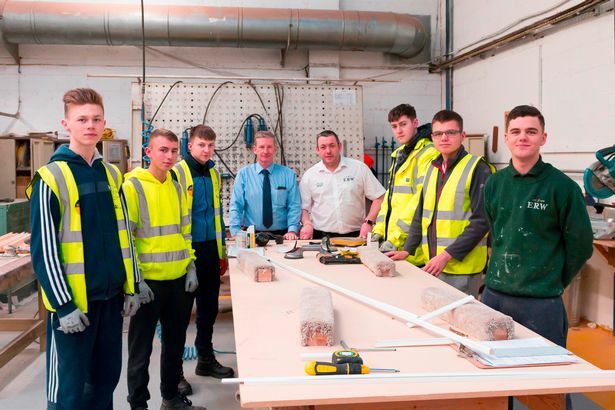 After hearing about the construction giant’s collapse last Monday, family-run firm ERW Joinery told the group of lads “no matter what happens, your future training is secure with us”. Three were already midway through their training; while the others were due to start at ERW when they were told about Carillion’s liquidation - a move that effectively threw their contracts on the scrapheap. The Skippers Lane firm says it has a “long term commitment” to all its staff including its young apprentices. Its head of design and issuing, Jamie Dixon, was himself an apprentice when he started with the company and is now an “integral” part of the business. ERW has been established since 1979, and provides bespoke timber frame windows and doors to homes and businesses across the North. Up to 1,400 apprentices could be caught up in the collapse of Carillion, it’s been reported, while 19,500 workers across the UK are facing an uncertain future because of the liquidation. Phil added: “Even after the news breaking of Carillion on Monday we went ahead and interviewed a number of apprentices as we had previously planned, and we have since appointed three new apprentice’s into roles within our business. “We are keen to invest in the younger generation with a view of them going into full time employment within the business once they have completed their qualifications. “It’s an uncertain and sad time for many young people in Teesside, and we will be doing what we can to support the younger generation in skilled trades like ours.